Fun And Fancy Free, Walt Disney's 9th full-length animated masterpiece, is a delightful gem that sparkles with charm and is right in history-making Disney moments. It was the last animated feature starring Walt Disney as the voice of Mickey Mouse, and the only film featuring all four of Walt Disney's most famous characters - Mickey Mouse, Donald Duck, Goofy and Jiminy Cricket. Following Disney's classic tradition of great storytelling, unforgettable characters, music and adventure, Fun And Fancy Free is the joyful telling of "Bongo" and "Mickey And The Beanstalk" - two timeless tales magically brought to life by the beloved Jiminy Cricket and the dazzling combination of animation and live action. A beloved cast and unparalleled fun are yours to enjoy in Fun And Fancy Free - perhaps Disney's most joyous film ever. Between 1943 and 1949, Disney released six primarily animated films plus Song of the South, a mostly live action that included a strong cartoon component. That era's So Dear to My Heart also tossed in some animation with the live action but did so to a rather negligible degree. All of these primarily animated movies were what they called "package" pictures. That means that none of them maintained a single narrative ala most of Disney's other animated films such as Pinocchio or Bambi. Instead, these pictures combined a variety of pieces into one feature-length film. 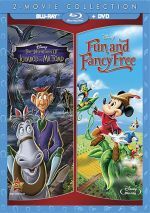 Most of them tossed in a whole bunch of short cartoons, but two exceptions exist: 1947's Fun and Fancy Free and 1949's The Adventures of Ichabod and Mr. Toad. Those efforts split their running times down the middle with two different stories per movie, so instead of a slew of brief cartoons, we get two reasonably long ones. While I generally enjoy these “package” films, they're clearly some of the weakest work that's emanated from Disney animation studios. Actually, if you examine Disney's first 30-plus years of feature films, they are the worst projects to appear in that time frame. Only the malaise that affected the studio after Walt's death in 1966 - and which wouldn't lift until the release of The Little Mermaid in 1989 - prevents these pictures from representing the nadir of the studio's output. Although I'm not wild about offerings such as Melody Time or Saludos Amigos, I definitely prefer them to relative clunkers like The Fox and the Hound or The Rescuers. Of all the package films, Fun and Fancy Free may be the best. Neither of its pieces can be considered a classic, but both are quite enjoyable in their own right. "Bongo" suffers from some padding. The plot itself stays quite simple: we see a little of Bongo's circus life - mainly to understand why he wants to leave - and then we observe his adjustment to forest living and his problems interacting with other bears. Bongo quickly falls in love and much of the cartoon concerns his travails in that department. That's not much of a story to take up roughly a half an hour of space, so Bongo's romance with Lulubelle gets stretched to its limits. A musical interlude accompanies their initial infatuation, and it just seems to go on and on without end. "Bongo" features a couple of other musical pieces as well, but none appear quite as interminable as this one - it really slows the momentum of an otherwise strong tale. Still, "Bongo" remains a lot of fun nonetheless. The cartoon possesses a great deal of charm and even can be quite amusing as well. I particularly enjoy the segment in which the country sounds new to Bongo freak him out. Called "Mickey and the Beanstalk", the second is roughly on a par with "Bongo" in regard to quality, but it's a much more famous cartoon. That's probably due to the presence of Disney original three superstars: Mickey Mouse, Donald Duck and Goofy. Actually, without the package features, those characters never would have made it together into a feature-length film back during Walt’s lifetime. Mickey appeared in 1940's Fantasia, Goofy showed up in Saludos Amigos, while Donald could be found in Saludos, Three Caballeros, and Melody Time as well. In any case, this effort offers a fun retelling of the story of "Jack and the Beanstalk" in which our heroes fill Jack's shoes. 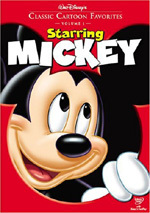 Actually, Mickey's the real replacement for Jack, with the other two more or less along for the ride. And I'm happy they are, or at least that Donald's there. Goofy has little to do in the story, but Don provides some of the cartoon's funniest moments. Neither Mickey nor Goofy ever did much for me, but the Duck always could be counted upon to spice up a story, and he doesn't fail to do so here. The scene in which he goes nuts from hunger is terrific. The rest of the program doesn't quite live up to that, though a few other scenes of Don's are pretty good, such as when he sees the dragonflies. Mickey's just so darned dull; he makes a decent hero, but his dreariness almost leads us to root for the much more colorful giant. In any case, "Beanstalk" has some slow spots, but it's generally a pretty entertaining piece. Bergen's narration runs over the cartoon, plus we also hear occasional interjections from the other three. The cartoon is also preceded by a brief live action scene that introduces those four - and includes Jiminy Cricket, the overall guide to Fun - and gets the show rolling. An additional live action portion ends the movie. The Bergen segments are actually surprisingly entertaining; he could be quite clever and witty through McCarthy and Snerd, and what might have been dull transitional scenes become fairly entertaining in their own right. "Fairly entertaining" remains a pretty good description for Fun and Fancy Free as a whole. It's not classic Disney animation, but it's a cute and charming piece overall. It works well when you're in the mood for some quick and light Disney. Fun and Fancy Free appears in an aspect ratio of 1.33:1 on this Blu-ray Disc. The film held up well in this appealing transfer. Sharpness almost always seemed tight and well-defined. A few slightly soft shots occurred, but those remained minor and created no distractions. Moiré effects and jagged edges did not appear, and edge haloes remained absent. Print flaws also failed to mar the presentation, so it seemed clean and fresh. Colors seemed lovely, with rich hues that looked properly saturated and bright. The tones went with a natural feel that was vivid and full. Blacks appeared deep and rich, and Shadow detail looked appropriately dense. I felt pleased with the image here. Though not as good, the film’s DTS-HD MA 5.1 soundtrack held up well for its age. This remixed the original monaural material – not included here, unfortunately – in a minor way. Indeed, the track remained “broad mono” from start to finish. Music spread gently to the sides but didn’t have much to do, and as far as I could tell, effects stayed centered. Surrounds added a bit of reinforcement but they seemed passive. The 5.1 track gave us a modest extension of the monaural source and didn’t add any memorable imaging. Dialogue sounded warm and pretty natural on a fairly consistent basis. Effects were relatively lively for a dated soundtrack, and the music generally seemed clean and bright. Some loose bass cropped up along the way as well. Overall, the audio wasn't special, but it worked fine for its age – though I’m disappointed the original monaural track failed to appear here. How does this Blu-ray compare with the original DVD from 2000? Audio was smoother and clearer, while visuals looked tighter and more dynamic. I liked the old DVD but the Blu-ray gave us an obvious step up, especially in terms of picture quality. The Blu-ray comes with one major bonus: the 1941 documentary The Reluctant Dragon. When I saw Dragon listed as an extra here, I figured the disc would simply include the cartoon of the same name, so I felt pleased to get the entire one-hour, 13-minute, 36-second program with Robert Benchley. For my extensive thoughts on Dragon, please click here. To summarize, the documentary doesn’t exactly give us an in-depth look at the creation of Disney animation, but it remains fun and enjoyable. The addition of some exclusive shorts makes it even more of a winner. The Blu-ray presents Dragon in surprisingly strong fashion as well. The 2003 DVD on which it originally appeared came with a lot of issues, but the Blu-ray looked quite good, and it came with more than adequate Dolby Digital monaural audio. I’d probably have purchased a Blu-ray with Dragon on its own, so its inclusion here as an extra adds a ton of value to the set. The disc opens with ads for Sleeping Beauty and Legend of the Neverbeast. Sneak Peeks adds a promo for Disneynature: Bears. No trailer for Fun appears here. A second disc delivers a DVD copy of Fun. This comes with two extras, the best of which is a 14-minute, 57-second featurette called The Story Behind Fun and Fancy Free. Despite its brief running time, this piece packs in a lot of solid information and offers a satisfying look at the picture with notes from film historian Leonard Maltin, directing animator Ward Kimball and story developer Joe Grant. We get basic details of how the two segments reached the screen, but best of all, we see some compelling "behind the scenes" material. 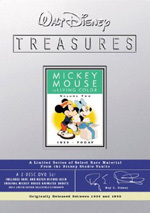 For example, we find rare film footage of Walt performing the voice for Mickey Mouse. It's a really fun and entertaining little piece. We get a Read-Along Storybook version of "Mickey and the Beanstalk". The storybook is nice for little kids, especially since it's potentially educational. As with the other "package" films made by Disney in the 1940s, Fun and Fancy Free will probably be more popular with collectors than with general audiences, but it’s still a lot of fun. Both of the film's two cartoons and charming and entertaining, and the program as a whole works nicely. The Blu-ray delivers strong visuals, positive audio and small but high-quality package of supplements. 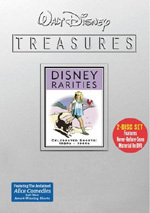 Disney buffs should feel pleased with this nice release. Note that Fun and Fancy Free can be purchased solely as part of a two-movie set. The Blu-ray also includes 1947’s The Adventures of Ichabod and Mr. Toad.